This post is sponsored by Hellmann’s Real Mayonnaise, but all thoughts are my own. From the parent side of things, I am now well aware of the ‘challenge’ parents talk about with having to make lunch for their kids every day. Challenge, of course, is the positive spin on pain in the rear. This kid likes this, this one likes that, how can we change it up, and so on. Quite the parental challenge, I do have to say. The husband and I are the ‘make the lunch the night before’ kind of peeps. After the kids are in bed, it’s a fun time for us to catch up on the day as we’re making and packing lunches for the next day. A number of the conversations lately have turned into conversations about how each other grew up. He grew up in the Midwest and me here in San Diego. He, of course, was the pickiest eater on the planet and I was of the camp that I would eat whatever my Mom made that day, with the exception of cream cheese and jelly. I don’t know why, but I couldn’t stomach that. P.S. I think they sound delightful now!! The other night, my husband asked, “What is the classic sandwich your Mom would make that brings you back to your childhood?” After thinking a few minutes, I turned to him with a smile on my face… “A BLTA for sure!” “You had avocados as a kid?” “We had avocado as babies in San Diego.” He had his first avocado when he moved west in his 20s! 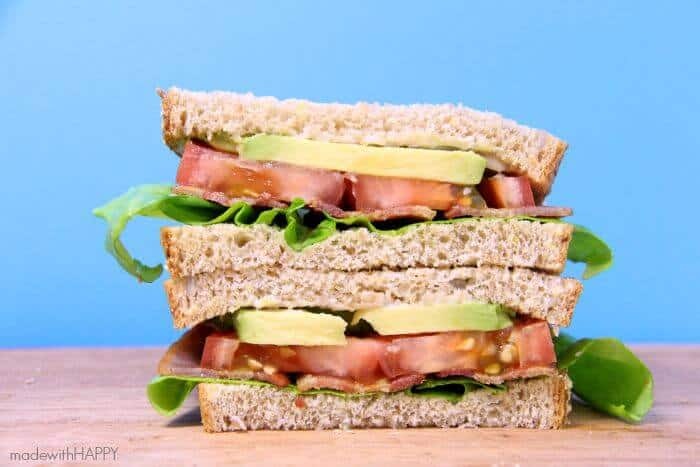 That’s it; we’re making Classic HAPPY BLTA’s for lunches tomorrow!!! Bacon – At least 3 slices, because who doesn’t love bacon? 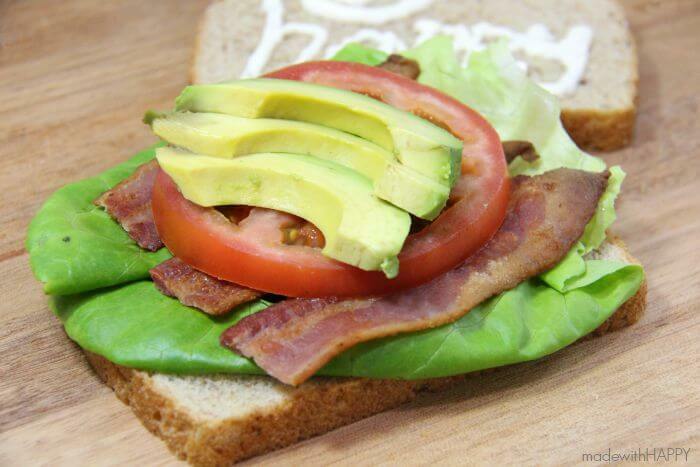 I like to stack my HAPPY BLTA with lettuce, bacon, tomato and then the avocado on top. While my Mom used to leave a note on the outside of my brown paper bag, I thought why not leave a sweet HAPPY note in the mayo reminding my kids that they make their own HAPPY each day! You can never have too much mayonnaise, am I right? Lucky for husband, I made enough to pack his lunch with one of these beauties too! Yummo! What is the classic sandwich your Mom or Dad would make that brings you back to your childhood? Came by to check on my fellow Hellmann’s recipe developers. 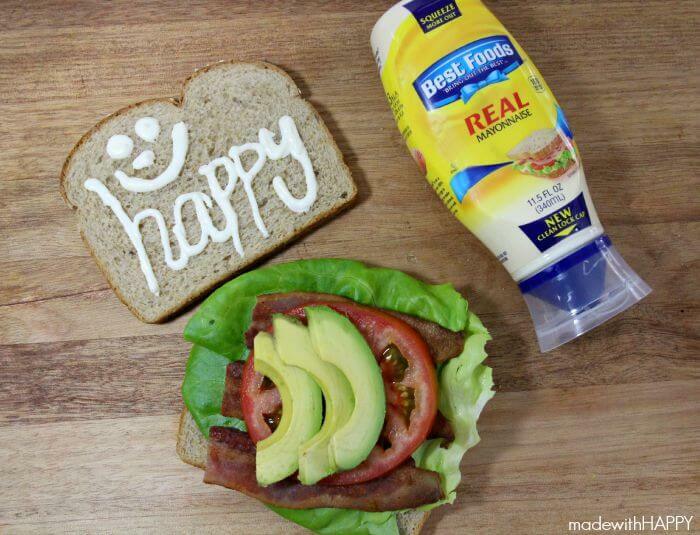 Love your Mayo message. 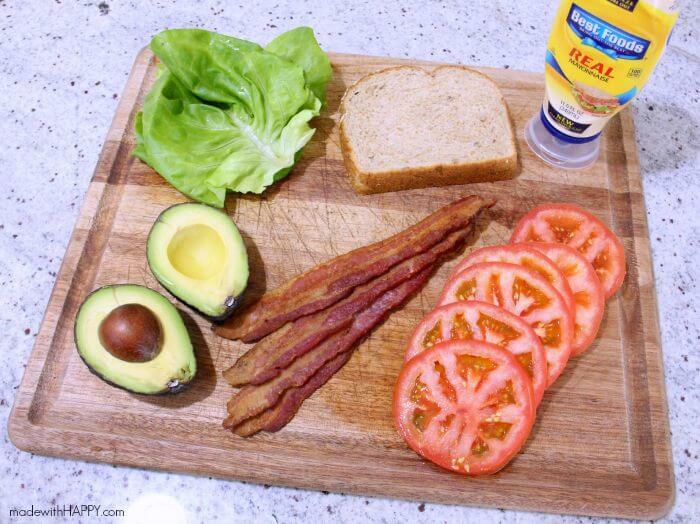 BLT’s make me VERY Happy!!! 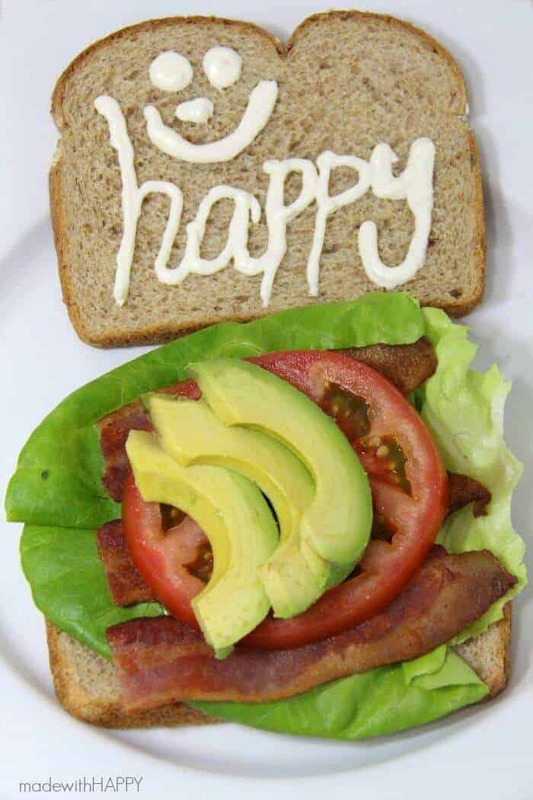 Avocados always make me happy!